A May Day rally in downtown Montreal turned ugly Tuesday evening when police moved in to break up a protest of several thousand "anti-capitalist" demonstrators, arresting more than 100 people. 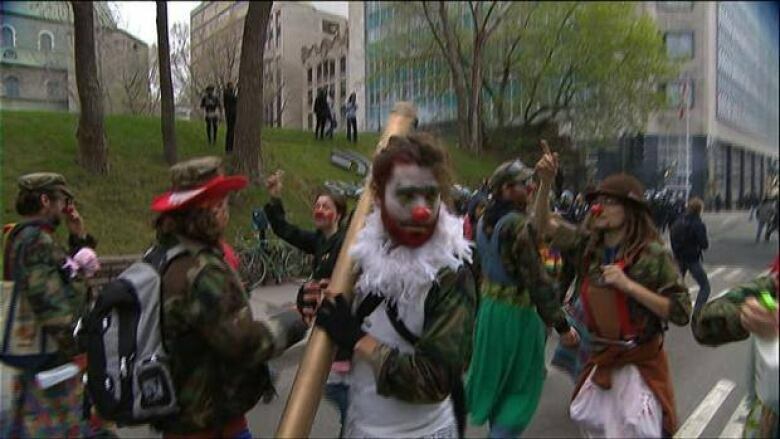 Anti-capitalist protesters march in downtown Montreal on May Day. Police arrested more than 100 people in downtown Montreal on Tuesday night, in an ugly clash with protesters — many dressed in black and some with bandanas over their faces — marching under the banner of "anti-capitalism." A May Day rally began peacefully at around 5 p.m. ET, but it disintegrated into mayhem and violence within an hour, as at least 2,000 people marched through the streets. Many wore the small red square that represents Quebec's student movement against tuition fee hikes, although this rally was organized not by students but by a group known as CLAC — or the Anti-Capitalist Convergence of Montreal — a group known for its confrontations with police. Just after 6 p.m. ET, Montreal police declared the march illegal, releasing sound grenades and chemical irritants into the crowd as some protesters hurled rocks and other objects, including molotov cocktails, at police cars. Protesters dispersed briefly, but then regrouped. A police car is spattered with paint during Tuesday night's May Day riot in downtown Montreal. Police said at 10 p.m. ET Tuesday that 34 people had been arrested for criminal acts, including mischief and assault, and another 75 detained for breaking municipal by-laws when they refused to disperse on police orders. Police said those arrested will appear in court Wednesday. A parallel May Day rally organized by union activists took place Tuesday evening in Molson Park in the Montreal district of Rosemont. It was also attended by many striking students but ended without incident. The anti-capitalist protest continued with a heavy police presence, even as students gathered nearby at 8:30 p.m.ET at Émilie-Gamelin Park for an eighth night rally — another demonstration against planned tuition fee hikes.